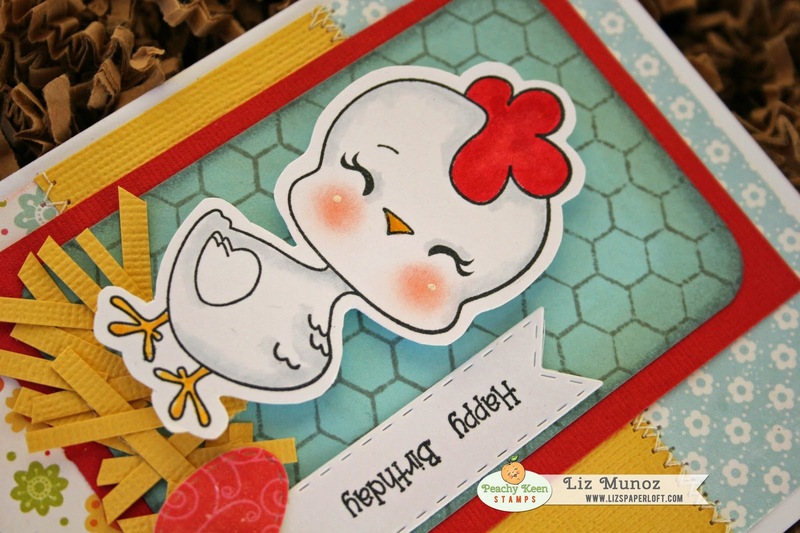 Liz's Paper Loft: Peachy Keen Mid-month March Release Blog Hop ~ Cool Chick! 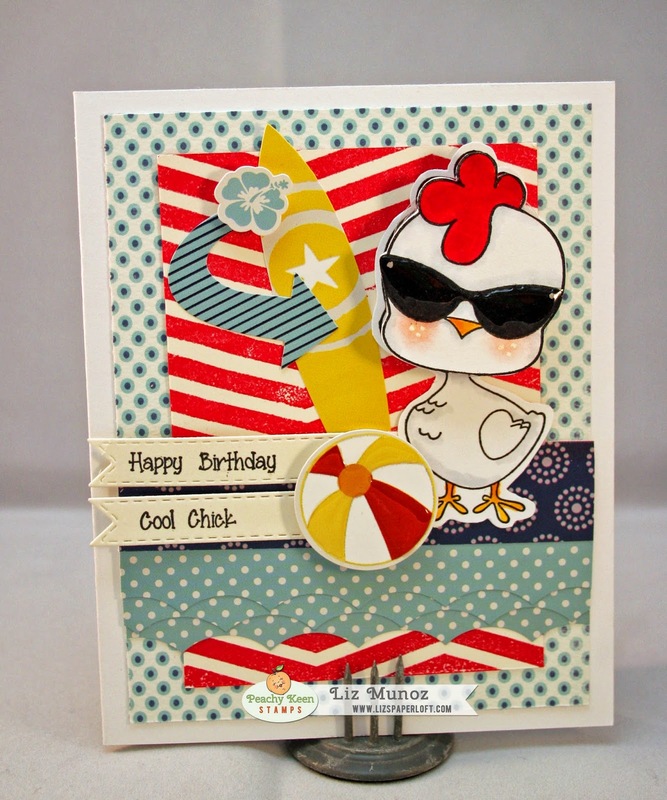 Peachy Keen Mid-month March Release Blog Hop ~ Cool Chick! 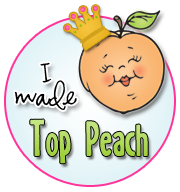 Welcome to the March Mid-Month Release Blog Hop at Peachy Keen Stamps! 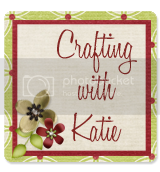 You should have arrived here from Peachy Keen's Blog, if you’re hopping along in the set order, but if you just happened stop by to see me, then you can go back to the beginning at The Peachy Keen Stamps Blog and start from there so you don’t miss one wonderful project. Grab your favorite beverage and relax with us for a few minutes as you take in the talents of our team, and be sure to leave comments (and a way to contact you, if you win) along the way for a chance to win all four sets in this release! That’s right!! One lucky person who hops and comments with us today will win all four of these sweet stamp sets! Thanks for joining us today and ENJOY THE HOP!!! I have two birthdays this week, one of these is for a friend and the other is for my niece. Isn't this the cutest chicken!!! I love him with the sunglasses, but I couldn't just stop there...I had to put his head on a wobble! Oh and more sentiments to go with the chicks! Tons of fun, quirky, and corny sayings! You're going to love them! I stamped the chick twice and cut out one of the heads and added the wobble behind just the cut head. Since the chickens are so fun to work with I had to make another one! 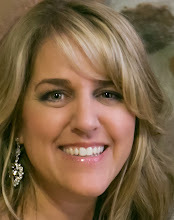 Now it time to head over to the FABULOUS Brigit Mann's Blog! You're going to LOVE her project! 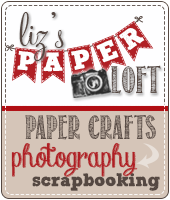 You’ll find the complete blog hop order on The Peachy Keen Stamps Blog should you happen to get lost along the way. Need a Challenge? 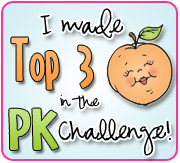 Peachy Keen's Sketch Challenge is still going on...click on the sketch on the upper right to see the details. Adorable. I've been torn about getting the chickens but I'm getting closer. both are amazing cards, I love how you've shown how versatile these stamps are. The summer themed card just rocks! PKS Never disappoints! I love your projects. Your family will love receiving these. And that chickie head on an Action Wobble? Shut the front door! Awesome! Super adorable cards, Liz! Bright and fun and done with flair and perfect attention to details! LOVE them both!! I just LOVE your cards Liz!! These chicks are so super ADORABLE and you totally ROCKED with both card designs, papers and those CUTE images!!! Great cards! Love the sunglasses! Adorable cards, Liz! Love the shades on the first chick! Your cards are adorable Liz! Love that wobble head!! TFS! These are just both flipping adorable!! Love your first card and the dimension that's was added using the action wobble, he is so cute. 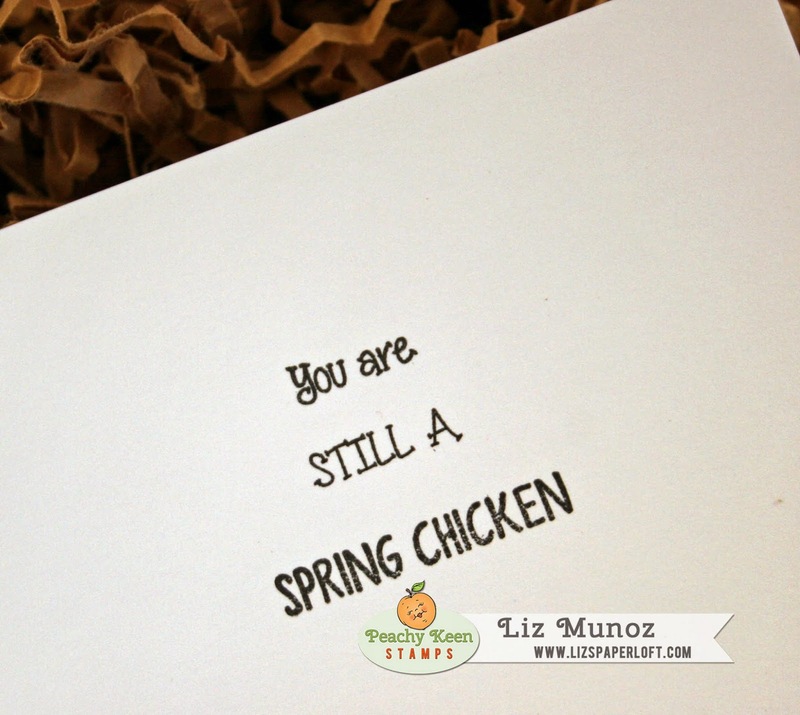 Your second card is darling, love the scene and how it kinda looks like your chicken is in a coop! Liz ~ both of your cards are ADORABLE but yet again BEAUTIFUL! LOVE all the details and again there is something about a chick in glasses ~ just makes me smile! So HAPPY I ordered this stamp set! Super cute cards. I can see why you had to make two. Those chicks are adorable. TTFN from a new follower. He is a cool chick. then he turns into a fab chick. I love this stamp set. So very versatile. 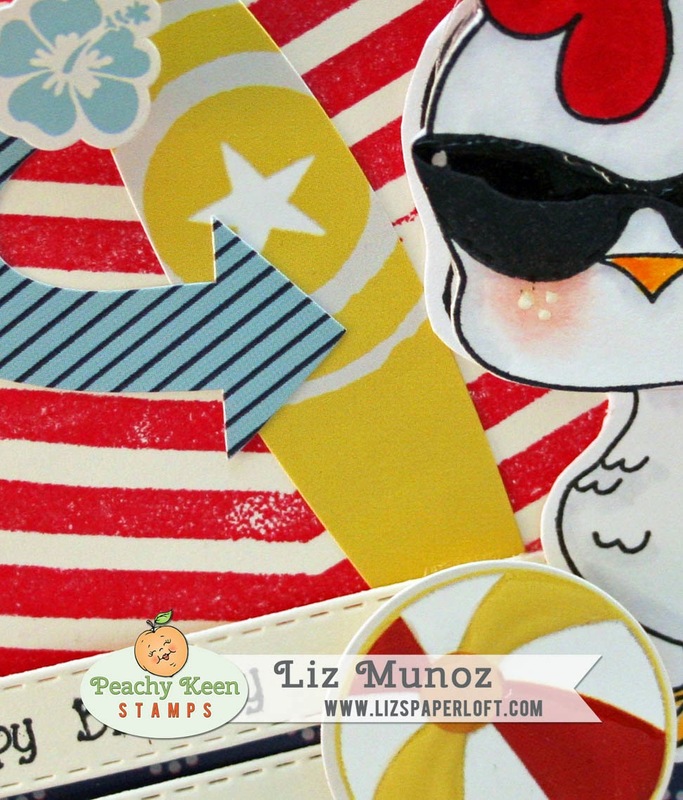 great background stamps and I love the little sunglasses! Too cute. OH MY LIZ! You blew my mind with these super cute cards, pics and explanations! I need more instruction and you have provided ABOVE and BEYOND! I love your work! Wholly moly! These cards rock! I am lovin' the Spring Chicken one! Creative juices flowin'! Oh my these cards are fabulous! I think my favorite is how you popped up the chicken to have the coop behind him. Looks real!! 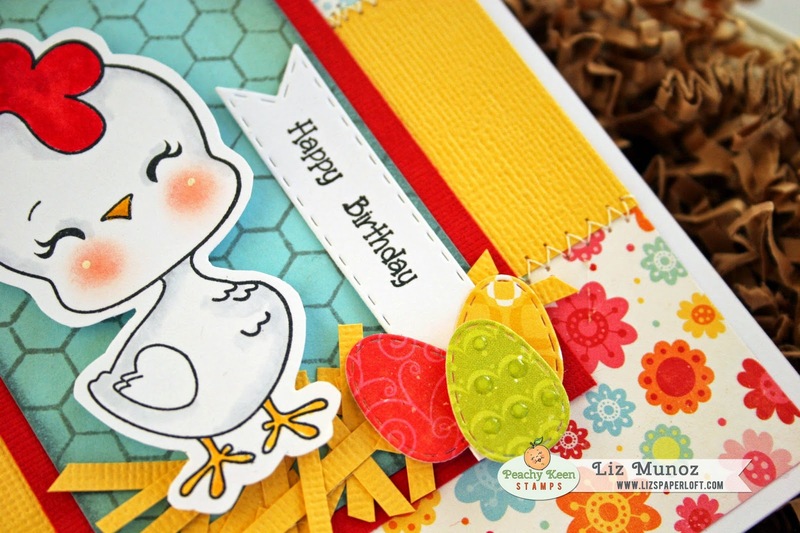 Awww Liz, what a way to start this hop--with your fabulous cards! These are both SO super adorable, I can hardly stand it! I love your cool dude getting his wobble on! The details are so amazing--look at those darling sunglasses-LOVE!!! 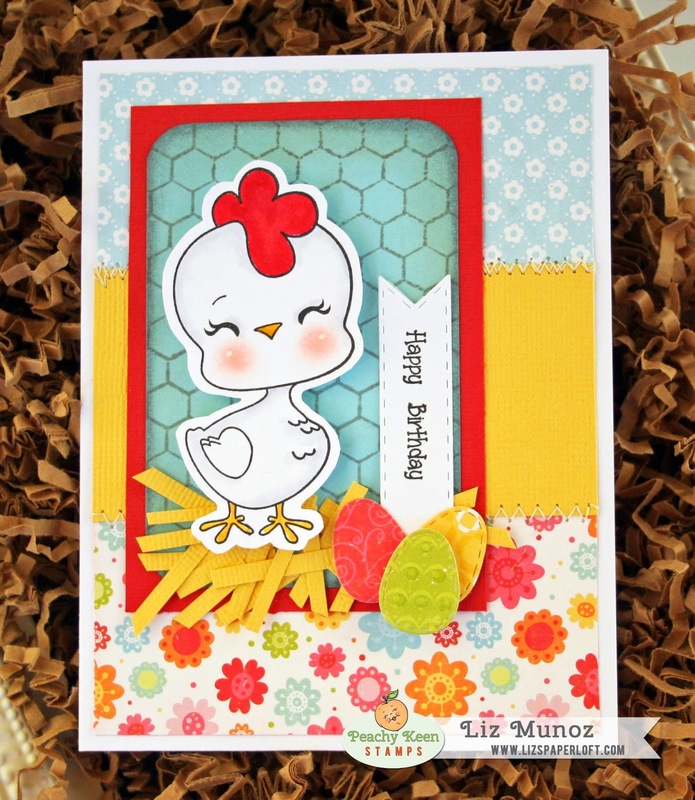 And your 2nd card is so fun with this sweet chick and the detailing again, is awesome!!! You eggs look wonderful! 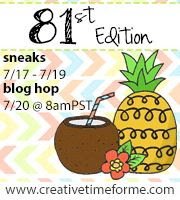 Ok, enough rambling for now :) Thank you so much for starting this blog hop off with a bang! You are one cool chick!!!! Super cute cards!! 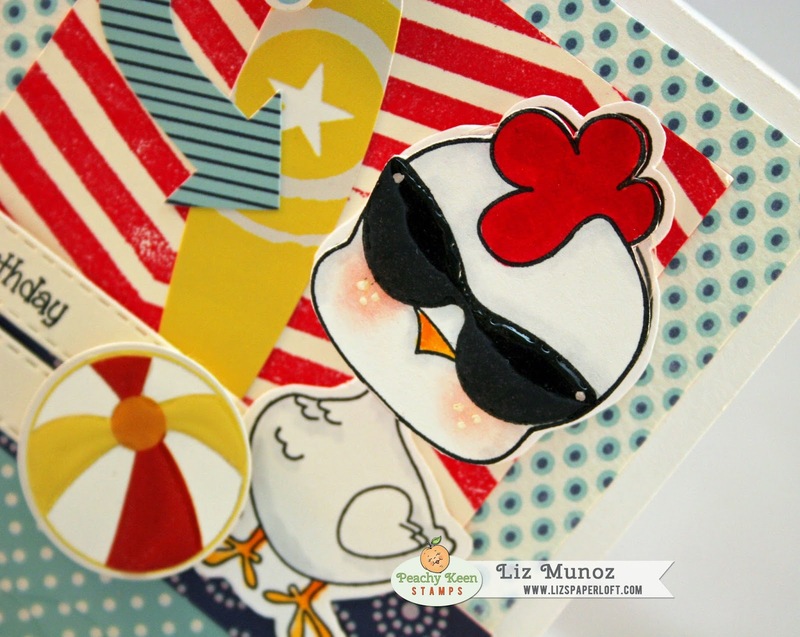 I love how the cool chicks head wobbles. .
Love these cards Liz, so bright and cheery, great job!! Oh my gosh these are just ADORABLE!!! I love them!! Great job and inspiration! 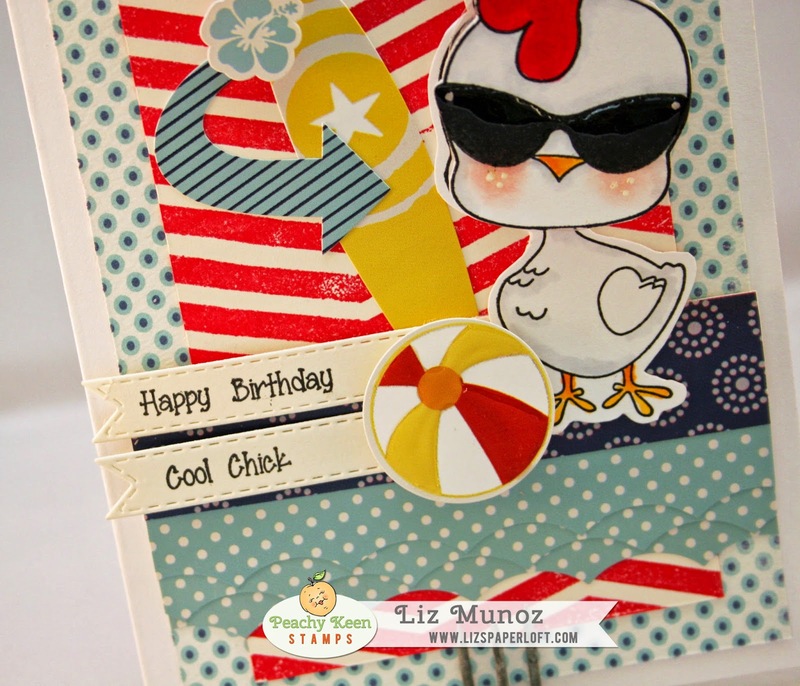 I love that you took a chicken and turned it into a beach theme! Very creative! Both cards are so darn cute! Love the two cards!! Super cute the second one!!! I love your cards Liz. They are adorable. Awesome job with the new release Liz!! 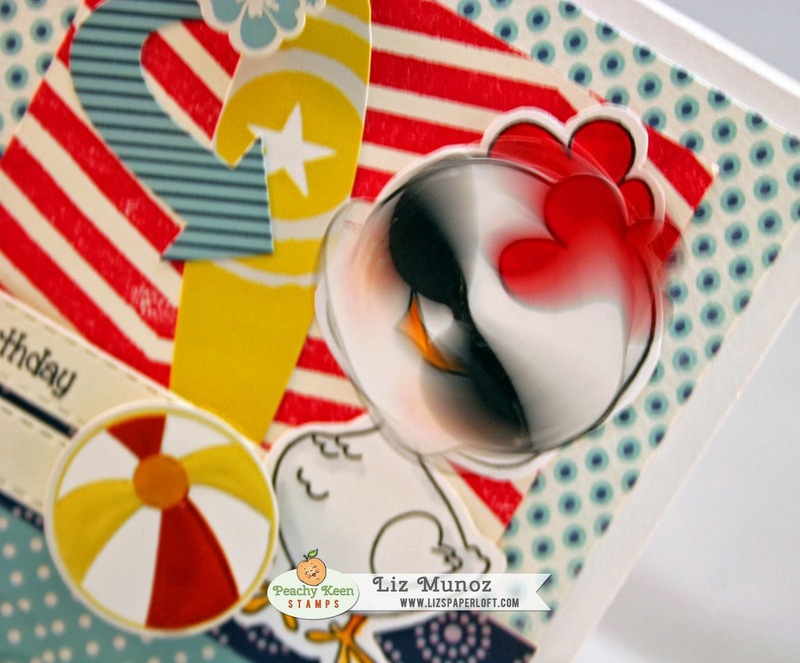 I really love the bright and happy colors on these cards....the wobble on the chicken head is brilliant. I am sure they will be a big hit with both recipients. I am totally new to Peachy Keen and wow, I LOVE that chick. Your cards are playful and the bobble head idea is fantastic! Both cards are so adorable and I love the wobble head! Love the cards. The sunglasses are great on the chickie. Oh my gosh, these are so pretty and adorable!! I am lovin the chicken wire background. Absolutely adorable cards Liz! I love the sun glasses too and the addition of the wobble makes it perfect! Cute! So cute, I love the card! oh my goodness!! your cards are adorable!!! love the wobble head too CUTE!!! Very cute and colorful and I like the wobbly head. WOW! Fantastic cards. I adore the wobbly head so creative! What a treat!!! :) Two SUPER CUTE cards!!!!! Did you fussy cut those chickens or did you use the svg? If so, on what machine. They look great!!!! These Chick cards are absolutely cute. Thanks for sharing your ideas. Adorable!! Love that little chicken! OMG This is just wayyyyyyy to CUTE.